One of my favorite people on the planet is Kim Soper. 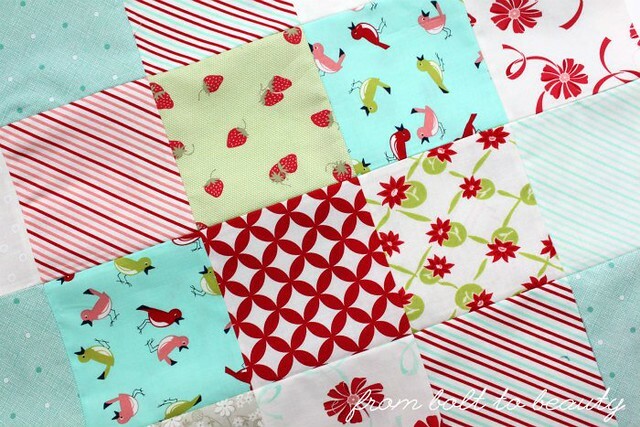 Kim is a quilt maker and blogger and, over the past few years, has become a dear friend. It was a thrill to be by her side at QuiltCon last year as she won awards for her Lincoln quilt. Earlier this month, Kim launched a series called the Creativity Project. 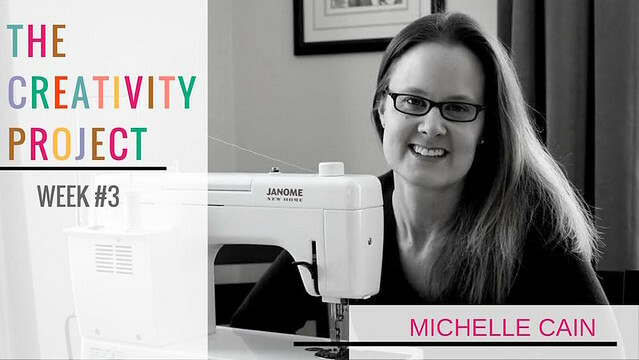 In it, she interviews makers about why they do what they do. I was honored to take part in this feature recently. I reaped the benefits of participating as soon as I gave Kim my answers to her questions. A little forced introspection proved to be a worthwhile, orienting activity and was particularly appropriate now, at the start of a new year. Her inquiries into my creative history and process helped me shape priorities on the horizon. Sharing that information with the crafty world at large—really baring my soul in certain regards (eep! )—encourages readers to hold me accountable to do what I say I am going to do. Two interviews posted before mine, from Melanie Tuazon (Mel in the Attic) and Jessica Skultety (Quilty Habit). Fearing their responses would affect my own, I didn’t read their interviews until mine went live. I thought I’d give both their interviews a cursory read—after all, I had searched my own crafty soul to answer the same set of questions—and was surprised how different their answers were and how their responses further informed my understanding of my own creativity. To learn more about the Creativity Project, go to Leland Ave Studios. If you’re willing to endure a little introspection yourself (I promise it will be worth your while! ), take part in Kim’s anonymous survey about creativity here. 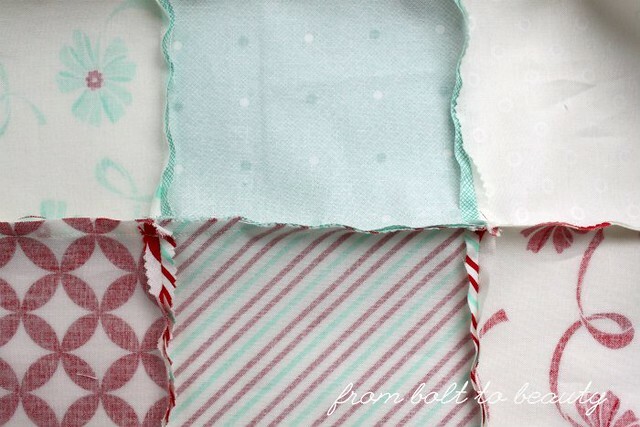 There are times I find peace in the routine of sewing. 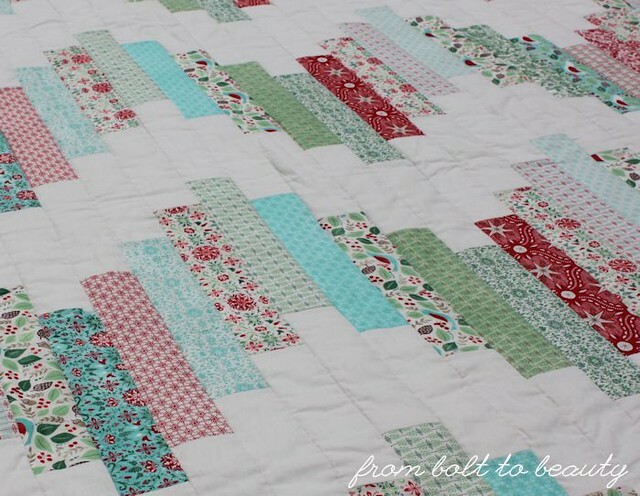 Cutting a project out, chain-piecing blocks, and pressing seams can be relaxing and meditative. Other times, I just need to get something done. In those latter cases, I try to cut corners without sacrificing quality. 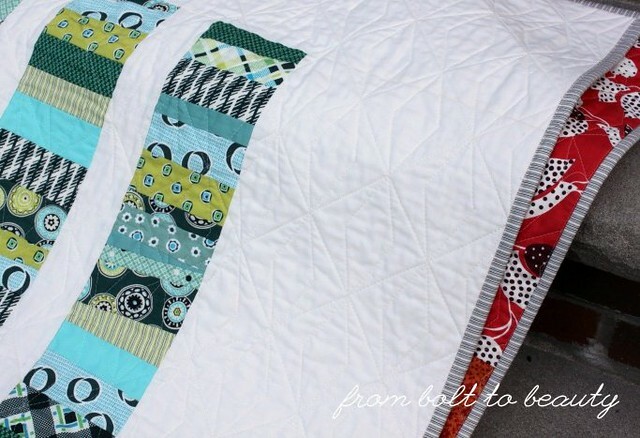 This simple patchwork was the perfect candidate for a piecing short-cut. Chain-piece the rows. I started by chain-piecing the rows. For me with this particular project, that meant chain-piecing the blocks for one row at a time. 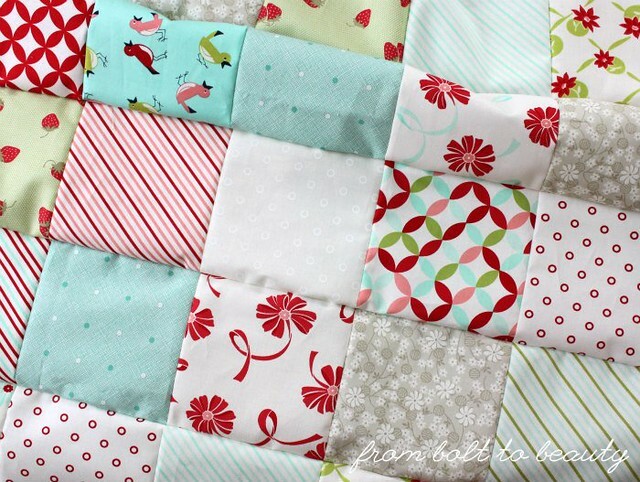 I’d sew the 14 blocks into 7 sets of 2 blocks and so on until the row was complete. Once one row was done, I’d start on the next. Finger-press the seams to join. Then I took two rows that needed to be sewn together and finger-pressed the last inch of the seams to join. I actually used my finger nail to open the seam up—it works better for me. Pin and sew. I pinned all of the joins twice—on both sides of each seam—and then sewed the two rows together. Two pins keep everything lined up for me. These are the seams before I take them to the ironing board. Press with the iron. 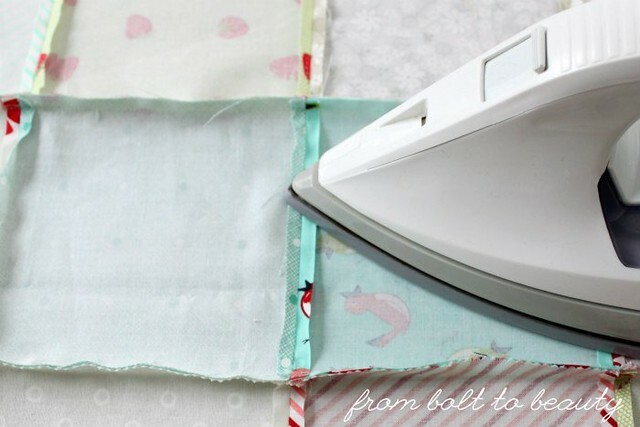 Once all of the rows were sewn together, I took the patchwork to my ironing board. First I ironed all the vertical seams, the ones I had partially finger-pressed. Then I pressed the horizontal seams. After everything was pressed on the back of the piece, I pressed it from the front. I start pressing the vertical seams. Spray for good measure. Finally, I turned the patchwork over to the wrong side again, gave it a light spray of Best Press, let that soak into the fabric, and pressed one last time from the wrong side. Ta da! 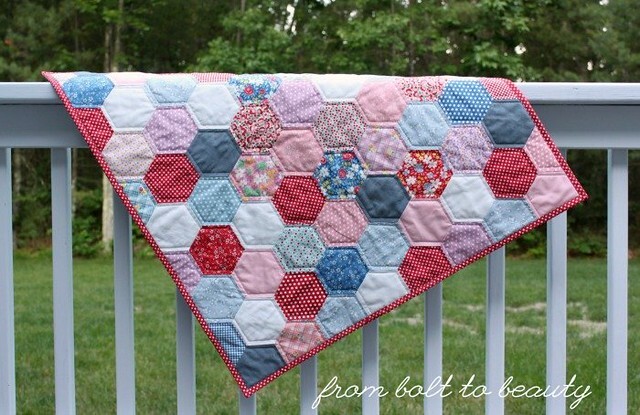 The finished, perfectly pressed patchwork! Some of you may be thinking that the time saver here would have been pressing my seams to the side with an iron. By alternating the direction of seams between rows, I could have nested my seams and skipped pinning. I could have, and so could you, if that’s what works best for you and gives you the results you want. 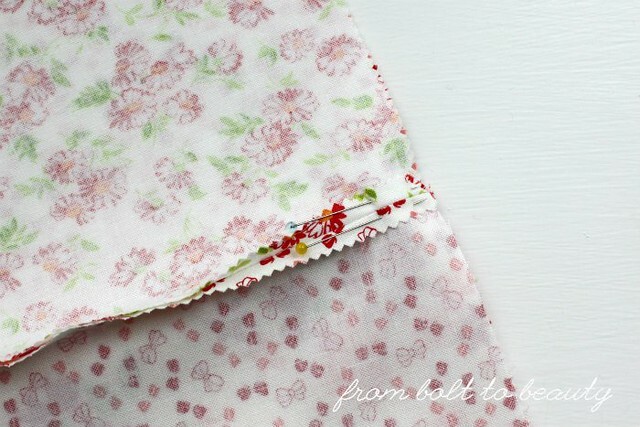 I greatly prefer sewing my seams open; I like quilting over seams that lie as flat as possible. Now that the crafty deadlines of November and December have passed, I can do anything I want on my sewing machine. Anything. I could make a bag or finish a WIP. I could start a brand-new quilting project. That should feel empowering, but it feels a little overwhelming and I’m not sure where to start. My most popular finish, both here on the blog and on my Instagram feed, was Grape Fizz. It’s a showstopping design by Amy Garro that I rendered in shades of eggplant and lavender. I’m not the connoiseur of purple that some of you are, but this design is so bold and graphic in its purple-osity that I can see why it was so well received. To see more pics, including close-ups of Mary Gregory’s quilting, read the post. 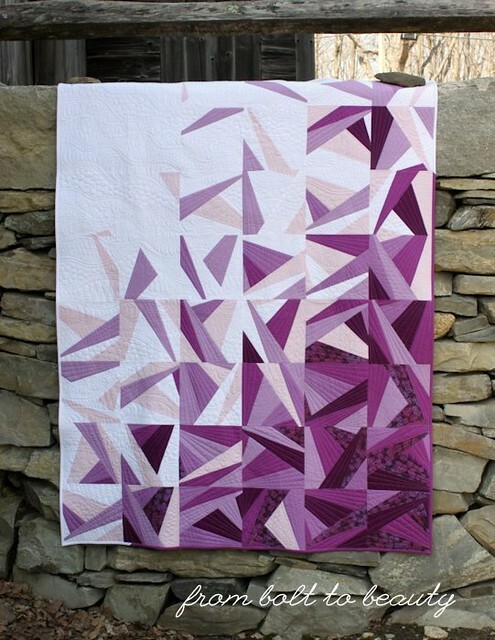 I love Grape Fizz, but I also really love my Ode to Art Gallery quilt. It was fun to play with all of those different prints and see them come together, with the help of navy plus signs, in a cohesive quilt top. I gifted the quilt just recently, and the recipient was elated. I don’t know much about her design sense, but I felt good about sending it off with her. The quilt is modern but not too modern. It has a lot of some colors and a lot of other colors, as well. 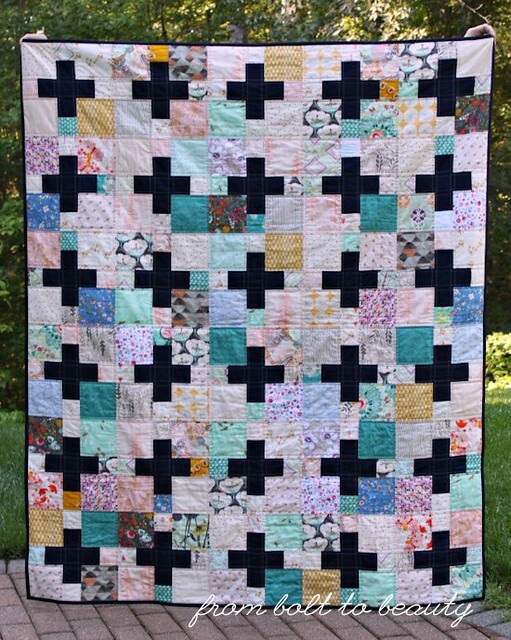 It’s pretty and feminine, and I like gifting pretty and feminine quilts to friends who are like me, the lone lady in the house. I tried two fancy-for-me quilting techniques this past year, both from Jacquie Gering’s book Walk. The first one, an orange peel design, went well but left a lot of room for improvement. The second, a cross-hatch with a secondary diamond pattern, however, rocked my world. It was a super fun experience with my walking foot and worth every stitch. Do any of those “mosts” resonate with you? If you have a noteworthy finish or quilting feat or other “most” you’d like to share, the rest of us would like to celebrate with you!